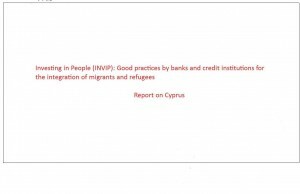 This report offers a brief description of the services offered to migrants by banks and other credit institutions, as emerging from interviews with banking officials, credit institutions, migrants and other stakeholders such as migrants’ organisations and trade unions. The first section describes briefly Cyprus’ recent turbulent history and the events creating the shortage of labour which in turn led to the change in policy in the 1990s, abandoning the restrictive approach and opening the country’s door to the immigration flows that resulted from social transformations in the ex-Soviet Union and political unrest in the Middle East. However, the policy assumption on which the new immigration regime rested proved to be ill-founded as the state was unable to contain either the numbers of migrants entering the country or the length of their stay.